Using the latest radiological and genetic techniques, a team of researchers from Egypt, Germany and Italy have determined that the boy pharaoh King Tutankhamun most likely died of malaria and a degenerative bone disease which also forced him to walk using canes, 130 of which (some with signs of wear) were found in his tomb. The researchers said that several other pathologies were diagnosed in the Tut mummy, including a bone disorder known as Kohler disease II, which alone would not have caused death. But he was also afflicted with avascular bone necrosis, a condition in which diminished blood supply to the bone leads to serious weakening or destruction of tissue. The finding led to the team’s conclusion that it and malaria were the most probable causes of death. Three other of mummies tested also had genetic traces of malaria tropica, the most virulent form of the disease, and several mummies shared a variety of genetic disorders like cleft palates, club feet and flat feet. 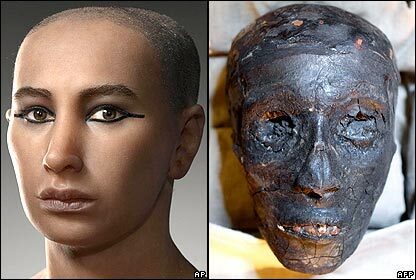 The mummies all seem to have been related to Tut. One was his father, Akhenaten, another his mother, Tiye, a third his grandmother, all of whom shared Tut’s blood group. The genetic testing indicates that Akhenaten and Tiye were siblings, and it’s thought Tut and his queen were also brother and sister, so it’s no surprise they are so many genetic disorders in the family. There are more details about the methodology of the testing in this Scientific American article. The Discovery Channel will be showing a two-part documentary of this study called “King Tut Unwrapped” on Sunday and Monday. You can see some clips of the shows on TDC’s website. This entry was posted on Tuesday, February 16th, 2010 at 9:38 PM	and is filed under Ancient. You can follow any responses to this entry through the RSS 2.0 feed. You can skip to the end and leave a response. Pinging is currently not allowed. And they did a remarkably effective job of it, too. I’m a little confused by one of the details, you say that through genetic testing they believe that Tiye and Akhenaten were siblings, but Tiye was thought to be Tut’s grandmother, Akhenaten’s mother. As far as I knew, they were at least sure of the fact that Tiye was Akhenaten’s mother even if the rest of the family tree may be a bit scrambled. Have they discovered otherwise? This would cause a pretty big rearrangement of the Amarna dynasty. After reading the article you linked to, I think they may have been referring to an unnamed wife of Akhenaten when they refer to his sister. Apparently his second wife Kiya is definitively not Akhenaten’s sister which means that either the body they found was that of Nefertiti or an unknown wife. Yes, he was inbred as I noted in the post. That wasn’t why he had malaria, however. flat feet is not a disorder get your info correct people!!!!! i think that king tut is the best because he startin whae he was yung and he only died at the ang of 20 year old but how could blane hi what if rilly got kill and he didn’t do eny thing and sume one whats the throen and thats why i an a 6th grander at kms and we lend from mr humfery that king tut proby was killed ang so he toled us that we will all whach a movey on king tut and see if he was illed or not and they foned a skab on the left cheke and betey thw erey that grost me out but that was not that bad the wahy that the people that bered king tut did a bad job on it and they did it in a herey thats why but thats not their fallt all king tuts stuf was gest thrin in their but thats no what to tret a ferow. Im from Kelly school ma, I love the history of king Tut! Its interesting to learn it. The image is not accurate because the noses don’t match up. The mummy’s nose is flat and wider than the image on the left. Yes well, noses are mostly cartilage. It gets squishy over 3000 years, even when mummified. weewewewewe finallyy we found some real information its really intresting! I vet that King tut was a great man and a great pharaoh and I wish that King tutor was still here but may he R.I.P. King tut we all dont now but we love you if you alive or dead and it had a long time ago.WE LOVE YOU KING TUT!!! King Tut was a great gay and King Tut was a great King . I all ways read about ne all the time and im just 6 years old. And my mom always said that i want find out how King Tut had died and a young age and you think how can a 6 year old can read just a hand full of words like King Tut full name. But it is so sad what had hapined to King Tut but a lot of Kings and Queens get sick. King Tut hates American children. I think this is really interesting, and ppl please dont be so illiterate!!! So, let me get this straight – Steve Martin WASN’T King Tut? King Tut is only another King that G-d sent to hell for being so mean and evil, Like the two city of Sodom and Gomorra. your wrong about king tut he wasnt evil he was nice and we all dont now if he was nice or not so get your fact stara about king tut didnt went to hell he want to the underworld were all pharoh go when they die and become gods or goddse. If scientists say there was no murder evidence involved then where did the wound on the back of his head come from..? What with all of this gibberish in the comments? I am very technical and critical! Also it’s so that the Kings/Queens, Pharaohs… However you’d like to call them, didn’t have such white(almost red-like) skin tones! It’s always like this, people will withhold the truth from the people!!! I’ll pause for now by saying: Most Historians, (Intentionally)Failed to talk about the thombs and pyramids of Colored(in other words ‘Black’)Egyptian Rulers… Long before there was even a (well known)Cleopatra!